Marilyn's Card Spot: CAS Watercolour - You Did It! 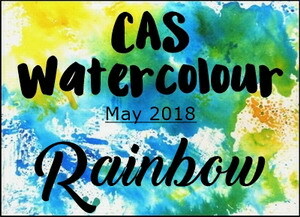 CAS Watercolour - You Did It! On a white panel the rainbow explosion was created using a stamp from MFT Distressed Patterns using a variety of Distress Inks. After stamping, each of the colored areas was placed lightly into water spritzed onto my craft mat to enable the colors to slightly blend/run. When the rainbow panel was dry, it was over stamped with a Water Droplets Background stamp. The white panel was created using Stitched Cloud Edges die and trimmed with black using the same die. The sentiment is from Hero Arts. Wish everyone a wonderful Mother's Day! LOVE your rainbow coloured sky with the stamped water drops, Marilyn. Such a great design it the large die-cut cloud. Thanks for sharing with us at CAS Watercolour! Your rainbow panel is so pretty, Marilyn! Love the blending of colors and the interesting edge design! Thanks for sharing with us at CAS Watercolour!